If you come to my country these day in January, you’ll enjoy the Vietnamese New Year. We call it Tet or Tet Nguyen Dan - the biggest festival in my country. Why do most Vietnamese love this event? 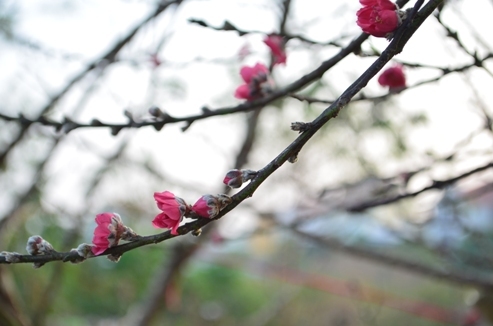 Like in other nations, it’s the moment of a new year, the time of a beautiful spring coming along. Not being a kid any more, I still love this festival very much. Somewhere deep inside my heart, I seem to long for the spring, and still childishly get excited as Tet comes. Why do I have this feeling? This is the longest holiday in Vietnam. Usually, we have about one week off with no school and no working. I can do what I enjoy (eating, playing, traveling, etc), or even do nothing without guilty feeling of being lazy. Spring brings beautiful scenery, warm climate combining with a solemn mood, new hope, and wish. It’s a real meaningful time for family, love, and happiness. Everybody hectically arrange to come back home to join annual intimate family union. We clean and polishing utensial, and decorate our houses with flowers and such seasonal trees as kumquat, peach blossom. I like seeing people wearing new and beautiful clothes and belongings to welcome a new year and to wish for health and luck. Traditional Vietnamese Tet always goes with traditional foods, which I believe you will love to eat. 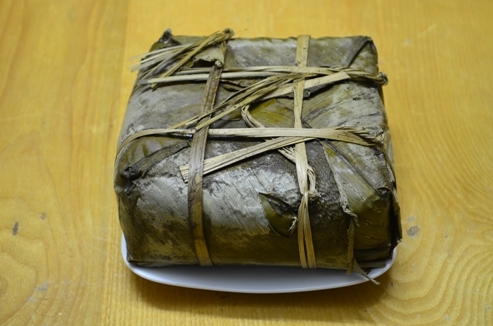 Chung cake (Bánh chưng): During Tet holiday, every family eats this traditional historical cake. It’s a square cake made from sticky rice, green bean, pork, and other ingredients. Vietnamese use this food in Tet festival, Hung King’s anniversary, and other special occasion. Read more about Banh Chung. Five fruits (Ngũ qủa): plate of at popular fruits such as mang cau, coconut, papaya, and mango (in the south); banana, grapefruit, kumquat, orange, apple… (in the north). These are not for eating in Vietnamese New Year, but for placing on family altar to worship ancestors. Jelly (Mứt Tết) made from many type of fruits such as: coconut, bumpkin, carrot, tomato, ginger, etc. Đón giao thừa (Welcome New Year’s Eve): In the Eve night, Vietnamese’s family also have ceremony to welcome new year. In the same day, we make an last-meal-of-a-year (cơm tất niên). Hái lộc xuân (pickup tree buds in spring) going out midnight, bringing home a small branch of green tree, preferably with flowers and fruits. This is considered sign of luck and refreshment. Xông nhà (first visit to a family in a new year): It’s important to choose the first person to visit and greet the family in the new year. That person is usually a male, and have good age that’s suitable to the host’s (based on in 12 zodiac signs in astrology). Suitable selection is deemed to bring luck and prosper to the family. Mừng tuổi / lì xì (giving lucky money): give children some lucky money to greet a new age and growing-up, and congratulate the aged who live longer with family and descendants. Chúc Tết (greeting in Tet): Going around to visit friend and relative’s family; meeting one another with good greeting and kind words. Lễ chùa (going to pagoda): in many regions, people have a habit visit to pagodas in the first day of Lunar New Year to beg for peace, joy, and luck. I summarize above main features of Vietnamese New Year, and why I love the occassion. How’s about you? Have you ever been here during Vietnamese New Year? You love Vietnamese Tet? You may want to share some of your thoughts here. Also, if you find useful information in this article, would you mind encouraging me with a Like? I’d love your thumbs up. Thank you! How to say Happy New Year in Vietnamese?